Not often do I read a book that takes my breath away. Margaret Atwood has managed to do that twice. 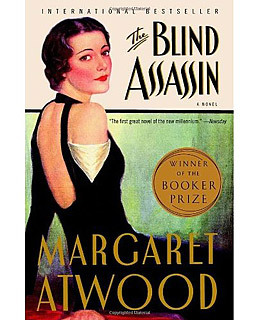 First with The Handmaid’s Tale, an absolutely brilliant and imaginative book, and now with The Blind Assassin. Every moment of reading, felt like a luxury, like eating a very rich and creamy dessert. Atwood writes beautifully and has some very inventive descriptions. It’s rare to want to read a sentence for a second time, not because you didn’t understand it, but because you want to savour every word. The story is of two sisters, Iris and Laura Chase. Iris is now an ‘older woman’ looking back on her life and all the events leading up to her sister’s death at the young age of twenty three. We learn in the very first page that Laura drove a car off a bridge and immediately our interest has been grabbed. Why did she do it? The book shifts between two main narratives; Iris, in the present, revisiting her past, and extracts from Laura Chase’s famous novel, The Blind Assassin. This book within a book was cleverly thought up and helps the story to unravel perfectly. Putting both narratives together, you gradually begin to realise that everything is not as you expected. The subtle hints that are let slip are almost grasped subconsciously and it’s not until close to the end that you realise you have understood for a very long time what has really been going on. I enjoyed Laura Chase’s chapters of a doomed love affair. The meetings between the unnamed man and woman were loving and yet realistic, almost exactly how you would image it to be. The man tells a story to his lover, a science fiction story about a land in a different dimension full of virgin sacrifices, great armies, wolves, slaves and blind assassins. Each chapter you learn a little bit more about this land and it becomes yet another story that you want to know the end of. Iris’ narratives are beautifully written. In the present she is growing weaker and is finding it hard to give up her independence. She struggles through her life as an ‘older woman’, walking around her old town, recalling the experiences she had there. We are taken back to when her father owned the button factory, which had been owned by his father before him. She describes her childhood with her sister aimlessly drifting about the streets or playing in the garden of their elegant home, trying to avoid their father. They lived a sheltered life and when Iris finally has to grow up, we learn about her adult life in a loveless marriage. She lives a grand life with fashionable clothing, but she is trapped with no way of escaping. Not only does Iris tell the story of her life and that of her sister, she portrays beautifully the pain and discomfort of growing old. The regrets, the fear, the humiliation and her envy of the young are told in a humorous and touching way. The Blind Assassin is brilliant, because it is clever on so many different levels, it makes you think, it makes you imagine and it takes your breath away. I have already ordered my next Margaret Atwood book, and I’m looking forward to being swept away for a third time. I have a feeling that there is going to be a large section of my bookshelf dedicated to one of my new favourite authors. Thanks! 😀 It’s one of my favourites along with The Handmaid’s Tale. It’s difficult to choose between those two though – they are so different! The Robber Bride sounds interesting. I had no idea that Atwood had written so many books! I wish I had discovered her earlier! I’ve just finished Oryx and Crake, so there will be a review up of that at some point in the near future. I’ve already read The Handmaid’s Tale which is what first got me hooked! I’ve heard mixed reviews about Cat’s Eye, but I know I’ll be working my way through everything she’s ever done. I love the way she can master different styles and every book I’ve read so far seems to be just perfect! Can’t wait to read it! Perhaps I will download it on to my kindle.